Last week a friend sent me a link to a recipe that had become a favourite with her family, she had taken the idea from Netmums. I have found Netmums a good source of frugal recipes, but I found that I could tweak them to be a bit more to our taste and budget. This dish calls for leftover roast chicken, but I think that any bits that you have in the fridge will work just as well. I used a few bacon lardons and a leek from the garden. I have not given amounts for the recipe, as that will depend on how many you are feeding, and what you have available. - whatever left overs you have in the fridge (bacon, chicken, mushrooms, onion, leeks, sweet corn etc.). 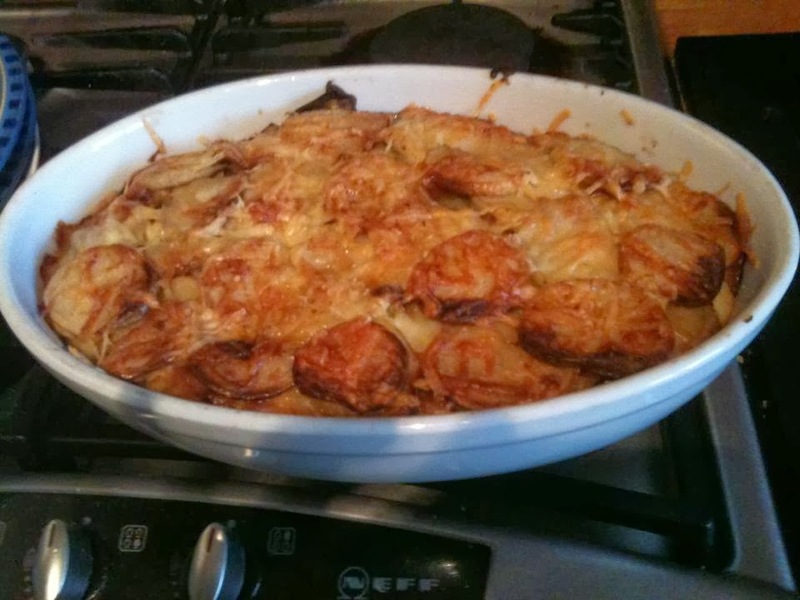 -Layer a ovenproof dish with thinly sliced potato. -Lightly fry some chopped onion, mushrooms and bacon lardons or whatever takes your fancy. Mix together with the cooked left over chicken, if you have it. -Spread this mixture over the potato slices and top with a layer of cheese sauce. Then a layer it up like a lasagne. Finishing off on top with a layer of grated cheese. -Pop in oven (180 C/Gas 4) for about an hour, but check that the potato is cooked. This is nice eaten with leafy salad, but again that depends on your budget. I hope you enjoy this as much as we all did, this is now set to regular appearance on our meal planner.